Elephants have many distinctive features most notable of which is a long proboscis, or trunk, used for many purposes, particularly for grasping objects. Through their entire life, an elephant's incisors grow into tusks which serve as tools for moving objects, digging and as weapons. Their wrinkled, one-inch thick skin, also serves to protect them from predators, insect bites and the conditions in which they live. 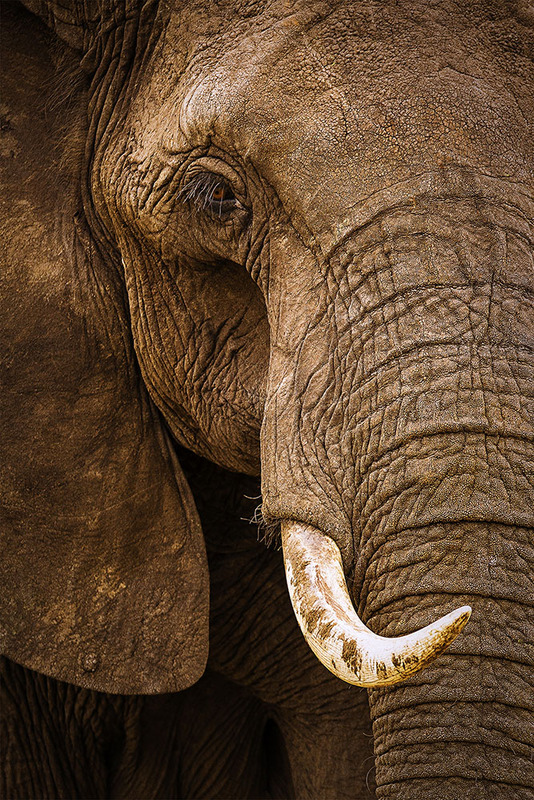 Elephants have huge ears, relative to body size, and they are also used for temperature regulation. It has been shown that blood passing through the ears of an African elephant may lose as much as 48 degree of heat, a valuable cooling device in the hot African summer. To increase the effect, elephants spray their ears with water and flap them to create cooling air currents. This large bull elephant was photographed while grazing in the vast Northern Serengeti plains of Tanzania Africa.